This terrific debut novel is set in a post-drought Califorina of the near future. A great mass of sand iscrawling like a glacier across the Southwest, and most of the region's human population has been evacuated. 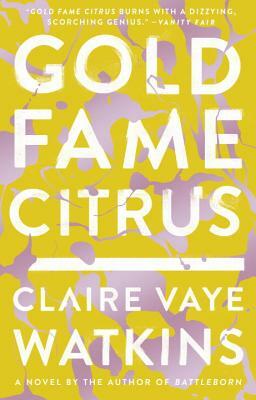 Gold Fame Citrus follows former billboard model Luz and her resourceful boyfriend Ray. After rescuing a mysterious toddler from a gang, Luz and Ray decide that they, too, must try to escape the condemned landscape of Southern California. While deeply connected to her characters, Watkins also provides a smart and layered portrayal of climate change, goverment, sociology, and human motivation. A Grapes of Wrath for the 21st century.